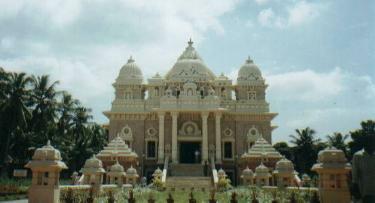 Both of the photos were taken at The Ramakrishna Math Campus in Mylapore, Chennai. The top picture is the temple or math (madam) itself. It is a very elaborate building on the outside, but on the inside it is very simple and beautiful. Sri Ramakrishna believed "ALL GOD IS ONE", hence the door to the math displays symbols of all prominent faiths. Inside the building it is a simple, empty hall, a meditation hall. The front has an alter, and the hall is empty for sitting and meditating. They also give "prasadam" or blessed food after you meditate.